Green shows ice present in 2013 which was not present on this date in 2012. Red shows the opposite. 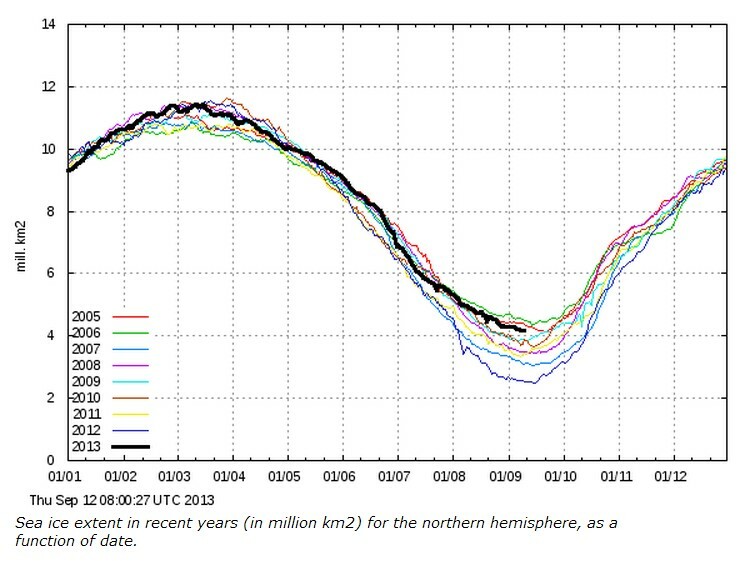 Ice extent has increased by 67% over the past year. This year “will without a doubt” rank in the top five lowest levels of ice extent ever recorded in the satellite era, and there is a good possibility that 2013 could rank second in terms of recorded ice lows, said Walt Meier, a scientist at the National Snow & Ice Data Center. Having said that he is still right it will be in the lowest 5. He is not likely to be right saying second. 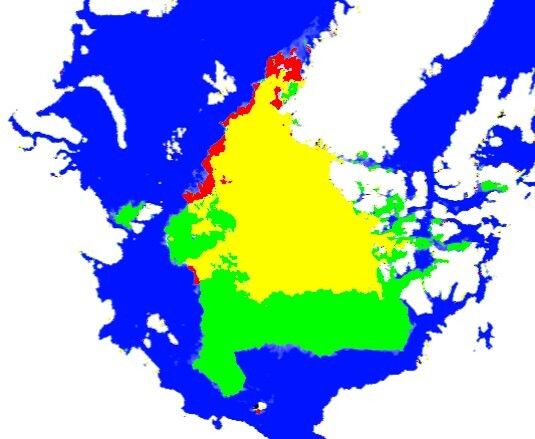 Arctic ice area is increasing now. Is that tricky to understand? Sure is growing new sea ice, USCGC Healy’ ice breaking ship has been showing lots of new skim ice forming in that area they are at. Many of the sea ice satellite sites are not showing the new ice yet. uscgc Healy webcam website match up pictures with location and see is sea ice satellite data is on or off. Location tracker to match up with pictures and sea ice sat data. As you noticed Steve, the NASA “expert” is wrong is both counts. Will it be in the lowest 5? We don’t know yet if it will be above 2009. But it’s effectively guaranteed to be above 2012, 2007, 2011, and 2008…that’s four below it. Very likely to be above 2010–that makes five. So no, not in the lowest five. I’d put it around 50/50 odds of being above 2009, so maybe 7th-lowest all time. 7th, nor even 6th lowest is in the lowest 5. Kudos to Walt Meier for going out on a limb and making a verifiable prediction on a time scale where it can be tested. But the prediction was tested and found false (barring a major loss in the back half of the month that would put us below 2010). No, you’re wrong, Andy. It will be the 7th lowest. The six years 2007-2012 are all considerably lower during September. Have top wonder just how many climate “scientists” the government has? Are they held responsible for producing accurate predictions; or can they just continue to be wrong year after year. In the military you screw up you own it. Poor performance leads to a short career. Getting hired to a government job should not guarantee life long employment. If they were right they would not need so may climate scientists. Keep their jobs and funds/grants coming. “Top five lowest levels”? How about just saying ‘bottom five’? These morons cannot even speak English. I’m sick of listening to these retards. It really is telling that they rank their ‘catastrophes’ as ‘top’. Doomers. Doing the “arctic ice” thing is getting a little monotonous. OK it’s true that employing the inverse scare tactics of the warmists is fun and yes it is completely burying them in a snow drift and yes it is highlighting again that warmism is completely wrong but just polar bear in mind that the recovery is from last years storms that broke up the ice which makes it not that spectacular. When it does get to be seriously spectacular over the next decade we will all be wishing we had spent more time learning how to build igloos and hunt mammoth in the wind generator prairies. It is time to move on and address the serious issues that lie ahead. It is time to build a new future adapting to the unpleasant realities that major global cooling is about to bring.